Being 2-years old can be tough. You are not a baby anymore but you are at the start of growing educationally and emotionally. With all that pressure, having cool toys is what can make a day go by faster and more enjoyable. Little boys are known for being rough and tumble but the toys on offer for 2-year old boys range from educational and stimulating to just plain fun. They can help your child better develop hand-eye coordination, cognitive skills, build problem-solving skills, play with others, and just enjoy being two. Some of the best toys for 2-year old boys are those that they can build or interact with, grow with your child, imitate real life items, encourage solving problems, and let your child be active. These may be the top 5 toys on our list, but there are plenty of other toys out there for 2-year old boys that your little one will enjoy. Here are some of the ones we like. Does your child have a love for both basketball and soccer? Then the VTech Smart Shorts Sports Center could be the activity center that you have been looking for. With an activity board that goes up to ten goals or baskets, your little one is sure to rack up the points. They can even make up games where they do a variation on the two sports. With the on/off switch, you can even play without all the noise. This game encourages physical activity and hand-eye coordination as well as helping to develop their sensory development. This sports center allows your child to play both soccer and basketball – or a mixture of both. The balls come already inflated and ready to go. The center is easy to assemble. The scoreboard records up to 10 baskets or goals. The VTech Smart Shots Sports Center plays sounds and over 50 tunes. This center is a great way for your child to learn numbers and shapes. This activity center is good for children ages one to three. Since the center is lightweight, it is easily moved around the house or outdoors. The VTech Smart Shots Sports Center requires batteries – and they do not come with the first set. The basketball hoop cannot be removed and attached to higher surfaces as your child grows. This set does not fold for storage so it does take up some room. The Woby Multifunctional Tool Workbench is a learning tool that can help a child build their imagination while having fun with lights and sounds. This musical tool set includes all the necessary tools to “fix” whatever is “broken” or “build” something new. There are flashing LED lights to engage a child as well as targets to hit and numbers that read out loud. This set is very interactive. This tool and workbench set allows a child to use their imagination to fix things. The Woby set includes a chainsaw, bench clamp, electric drill, screwdriver, wrench, nail, and hammer. The workbench makes sounds of real tools for a more enjoyable experience. The workbench also has LED lights that flash. This set has a storage drawer for all of your child’s “work” and collectibles. This set is good for children 18 months and older. There is a ball that can be hit with the hammer so your child knows exactly where to hit. The number scale reads the number out loud while flashing lights and playing music. There is even a place to put different shapes and the bench will make a sound when you get the shape sorted. 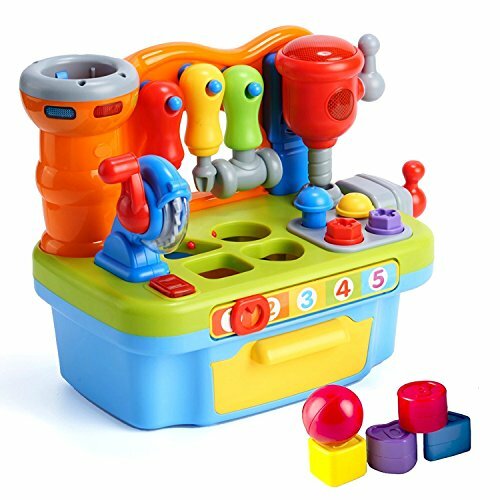 The Woby Learning Workbench plays five different songs. This educational toy requires batteries that are not included. The English pronunciation of some shapes may cause children to mimic them and it identifies the circle as “round”. 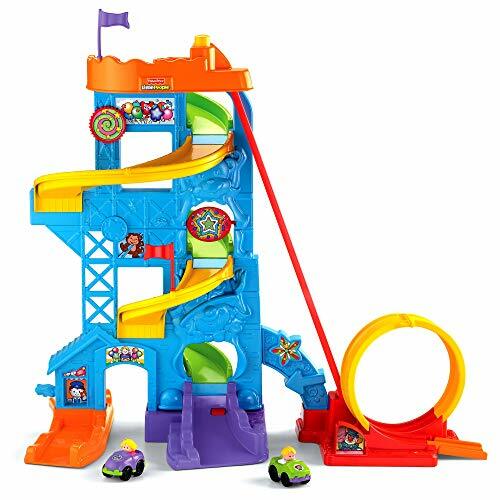 While your little one may be too young for a real roller coaster, they are the perfect age and size for the Fisher-Price Little People Loops ‘n Swoops Amusement Park. This over two feet tall toy of pure joy will get them excited as cars loop and swoop down the maze of 360-degree turns. 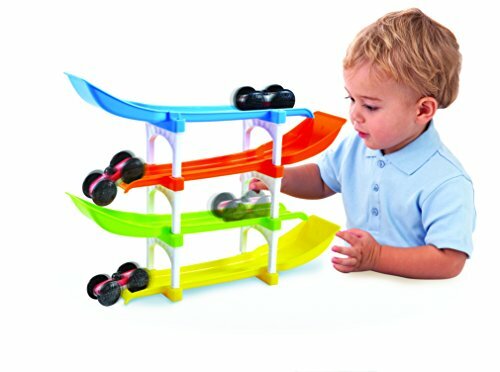 This toy will keep your little one occupied for hours with the many mini cars and the loops and turns. All of the pieces are the perfect size for a toddlers sized hands. 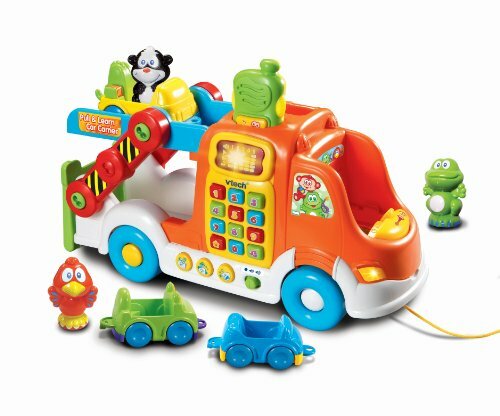 The Fisher-Price Little People Loops ‘n Swoops Amusement Park comes with 2 wheelies and a tall park for hours of fun. When the car goes under the monkey, the star spins. As the wheelies go down the parking ramp, your child can enjoy sounds and lights. Other small vehicles are compatible with this toy. This set does not fold or break down, so it does take up a lot of space in a room – not easy to store. Help your child’s imagination zoom down the race track with this KidSource Flip and Go Racer. This racetrack uses gravity to move your child’s car from one level to the next down four levels of fun. The large wheels of the cars allow the cars to flip at the end of each track and move from one level to the next. It is super easy to set up this set. The large track and car make it perfect for little hands to use properly. You can even play with the car without the track. This fun racetrack uses gravity to zoom your car down the four levels track. The large wheels on the car make it flip as it moves from one level to the next. The set is easy to assemble. The large wheeled car makes it easy for small fingers to place it correctly on the track. The car can even be played with without the track. This set does not require any batteries. The racetrack is great for children aged two to six years old. If the car is not placed on the track correctly, the gravity will pull it off the tracks. VTech is a company that makes amazing toys for toddlers. And the VTech Pull & Learn Car Carrier is no different. This toy lets your child decide who is in the driver’s seat by placing whatever animal they want in the driver’s seat and it is identified. The buttons on the side help introduce colors, animals, and numbers. You can ever remove the CB radio and use it for role play. With the attached pull string, your little one can pull this set behind them. This set even identifies the vehicles as they drive by. Now that is amazing! When you place an animal in the driver’s seat, it is identified. The buttons introduce animals, colors, and numbers. You can remove the CB radio for play. This set can be pulled behind your little one by its attached pull string. This set also identifies vehicles as they drive by. The volume on this toy is very low and doesn’t always engage the toddler. The pull string is very short; approximately four inches. One of the toddler toys of the Century has to be the LEGO DUPLO. One of those sets is the LEGO DUPLO My First Number Train. 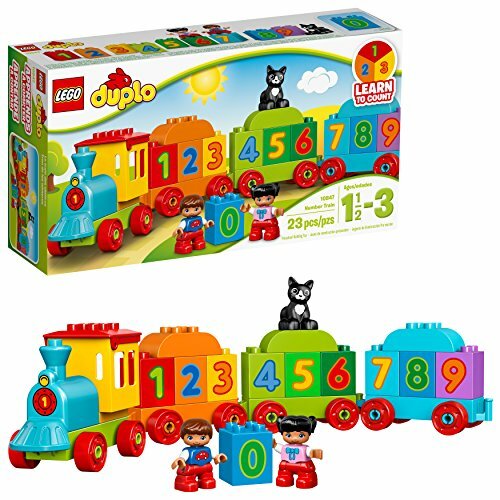 This set helps your child learn to count from 0 to 9 while building a train. This set even includes other figurines such as a cute cat and two children. This set even includes a locomotive and three train wagons – all which are buildable. Children can learn to count with the 0 through 9 numbers on the train. This set includes two children figures and a cat. The LEGO DUPLO is made for smaller hands so that they are easier to grip and handle. This set is great for children one and a half to three years old. This set includes a locomotive and three train wagons that are buildable. This toy requires no batteries but lots of imagination. Parts of the figurines may be choking hazards if they come apart. One of the toddler toys of the Century has to be the LEGO DUPLO. One of those sets is the LEGO DUPLO Town Airport. This set helps your child build hand-eye coordination and build fine motor skills. This set includes an airplane and airport that is buildable, a suitcase, luggage slide, a revolving control tower, and a boarding gate. The best thing about LEGO DUPLO is that they are made just for smaller hands so that they can handle and grip the pieces easier. While this set may not require any batteries, it does require a whole bunch of imagination! Children can learn to put together their own airport building to help build fine motor skills and hand-eye coordination. This set includes a suitcase, luggage slide, control tower that revolves, and a boarding gate. There is also an airplane to build to complete the set. This set is great for children two to five years old. 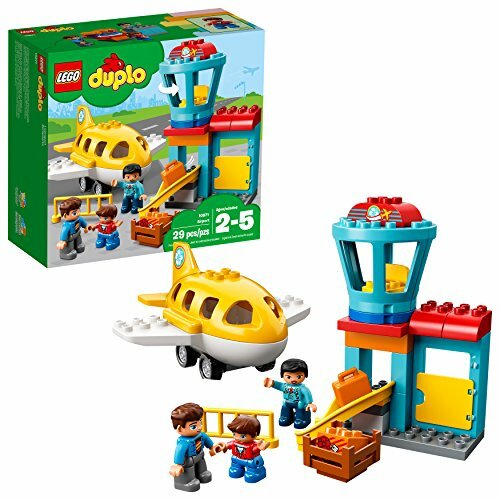 This set includes an airport and airplane that are buildable. Give your child a ride in a little red coupe. This ride is great because it has a floor board that comes in and out. This allows the parent to push the handle or the child to ride by themselves. The car has a high back which offers security and comfort. For a great break, there is a storage area for all your child’s possessions or a snack. There is a moving ignition switch and a gas door that opens and closes. The front tires spin 360 degrees. This car was made in the USA. The doors even lock for safety. 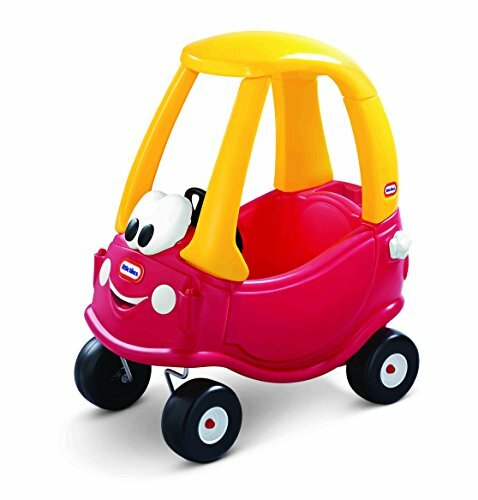 Give your child a smooth ride with this Little Tikes Cozy Coupe 30th Anniversary Car. The floor board is removable and has a push handle in the back so the parent can push the child. This car features a high back for comfort and security. There is a storage area in the back where your child can store all of their prized possessions – or just an afternoon snack. Your child will love moving the ignition switch and being able to open and close the gas door. The front tires spin 360 degrees. This Little Tikes Cozy Coupe 30th Anniversary Car was made in the USA. The door locks so your child cannot open and fall out mid-ride. Children up to fifty pounds can enjoy the ride. This car does not come assembled – and it is not an easy assembly process. Leave it to LeapFrog to make a cart that serves up a tasty treat while teaching a lesson. 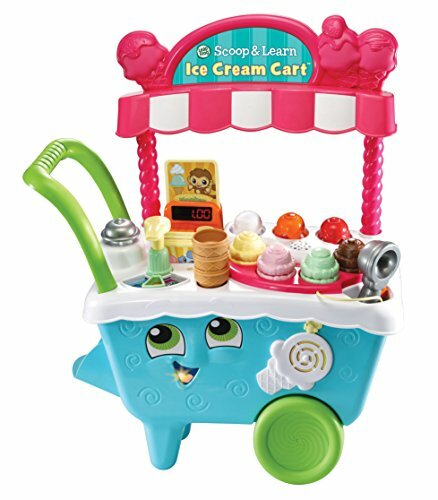 The LeapFrog Scoop & Learn Ice Cream Cart lets you imagine and the flavors and toppings you can come up with. There are animal order cards that help your child build memory skills and follow directions. Your child can count up to ten with a pump or coin button. Phrases help your child follow directions with flavors, numbers, and colors. Pushing the cart around helps build gross motor skills. The Ice Cream Cart even has songs and music. There are seven games that help develop memory, and build color and counting skills. Let your child’s imagination flow with scooping up ice cream with all of the toppings. This cart will help introduce colors and flavors. There are six animal order cards that help your child build memory skills and help follow directions. You can count to ten with the pump or coin button. Phrases help your child follow directions while being shown flavors, numbers, and colors. Pushing the cart around helps with gross motor skills. This cart even has music and songs. There are seven games that help develop memory, and build color and counting skills. This set includes three toppings, eight scoops of ice cream, three ice cream cones, six cards, a magic scooper, and an ice cream cart to store everything. The cart is lightweight and easy for a toddler to knock over. The items do not attach in the cone so they fall off easily. Your little one will love to pull all his little stuffed friends and toys around in his Little Tikes Lil’ Wagon. 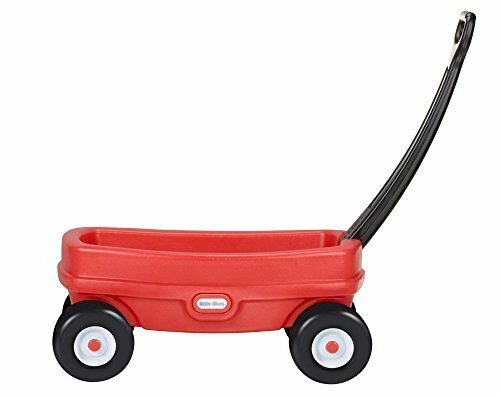 This wagon is the perfect size for your toddler to use and pull with ease. He can use this wagon anywhere – inside or outside. The wheels are made for inside but durable enough to handle the outdoors. The Little Tikes Lil’ Wagon is the perfect size for a toddler to be able to pull with ease. The wagon can be used indoors or outside. The wheels offer protection when used inside but still durable enough to go outside with. The handle folds into the wagon to make storing easier. This wagon requires minor assembly which is easy to do. This wagon is recommended for children one and a half and up. This wagon is toy sized and not for a child to ride in – but to pull themselves. When the wagon is empty, the wheels do not turn properly. 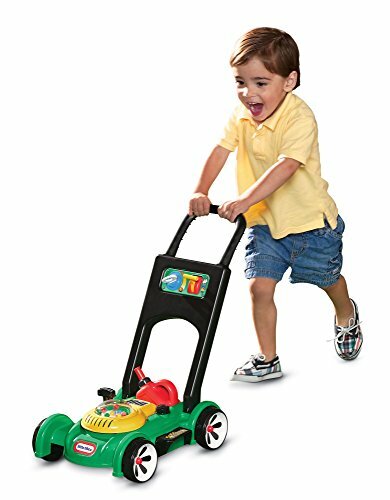 Your toddler will feel good about getting a job well done with the Little Tikes Gas ‘n Go Mower. The handles of this mower are perfectly sized for a toddler and allow them to push the mower over surfaces indoors and outdoors while “mowing” just like an adult. They will hear all the mechanical sounds, even without batteries, and can use the gas can. While they mow, the beads will pop, the key clicks, and the engine makes a sound when they turn the key. The Little Tikes Gas ‘n Go Mower pops beads as it is pushed. There is no need for batteries as all sounds are mechanical. Your child will hear an engine sound when they pull the engine cord. This mower has a moveable throttle and a key that clicks. Your child will enjoy the fact that the gas can is removable and the attached cap comes off for play. This toy is recommended for children eighteen months and older. This toy mower can be used outdoors as well as indoors. This mower assembles super easily. The wheels are a little hard to turn on grass and mostly you just have to slide it. The handlebar height is set and not adjustable so it may be too tall or too short for some children. There is nothing more old fashioned than a pull along toy. That is why the Hape Walk A Long Wooden Pull Toy is an Award Winning Toy. 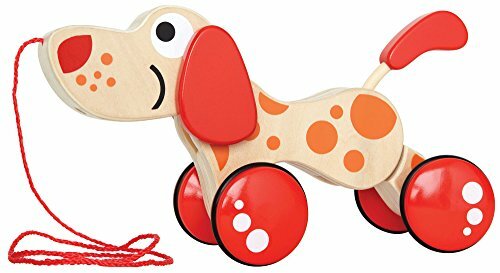 This toy will be one of your toddlers’ favorite toys as they make their wooden toy stop, sit, roll, and walk. This toy builds hand-eye coordination, dexterity, and manipulation. This toy inspires imagination and has a finish that is non-toxic. This toy comes in several animal choices to choose from. Your child can take their new pull toy for a stroll and make them roll, stand, and sit. The Hape Walk-A-Long Wooden Pull Toy helps build hand-eye coordination, dexterity, and manipulation. The pull along toy helps inspire imagination. The toys are made from quality wood with finishes that are non-toxic. You can choose from a caterpillar, a turtle, a puppy, or a crocodile pull toy. This toy won the best toy award in 2012 by Parent’s Magazine. The string is too short for following behind your child. Some of the designs are too front heavy and dive toward the floor making it hard to pull. Who doesn’t love going for an afternoon ride? And who does it better than Little Tikes? Little Tikes has come out with a 2 in 1 ride that can be pulled or pushed by the parent. This is the Little Tikes Deluxe 2 in 1 Cozy Roadster. This hot ride is memorable because it has a friendly face as well as a canopy to keep the sun off of your toddler. There are even a couple of cup holders for the parent as well as the child. The child can even enjoy the working horn (I’m not so sure that the parent will!). The tires work great outdoors but are safe enough for indoors on a rainy day. And best of all, there is a seat belt to keep your little one safely inside the car. The Little Tikes Deluxe 2-in-1 Cozy Roadster has a canopy to keep your little one out of the direct sun. The Roadster has two cup holders for hauling around drinks for the little one and a parent. The tires have enough traction for outdoors but are gentle enough on your home floors. The face of the Roadster features a friendly face. This toy even has a working horn. 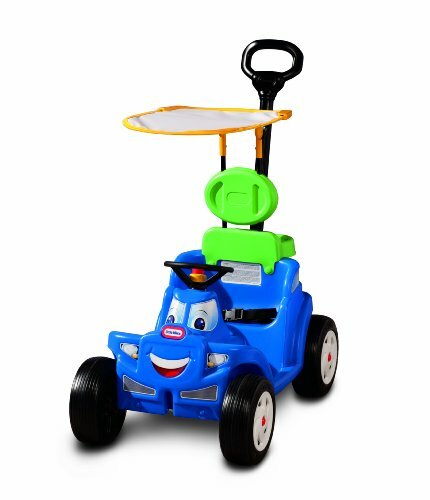 The handle can be placed on the back to push the roadster or attach the handle to the front so your little one can see you as you pull the roadster. This Little Tikes Roadster is made in the USA. To keep your little one safely inside the roadster, there is a seat belt. Assembly of the Roadster is required; and it is not easy to assemble – at all. The seat is on the small side. This ride on states that it is good for children one and a half to four years old. There is no way more than a two-year-old can ride unless they are on the small side. It is always more fun to play with others than alone. That is especially true when it comes to racing cars and playing chase. When you add the two together, you get the Prextex Pack of 2 Cartoon Radio Control Toys. You get one race car driver and one police officer chasing each other. Who chases who is all up to the imaginations of two-year-old boys. Best of all, this set is on different radio frequencies, so both cars will work independently at the same time. These cars make realistic sounds such as honking sounds, flashing of headlights, and police car sounds. Your child can have their first experience with radio control toys with this two pack from Prextex. The cars make realistic sounds, honk, and the headlights flash. 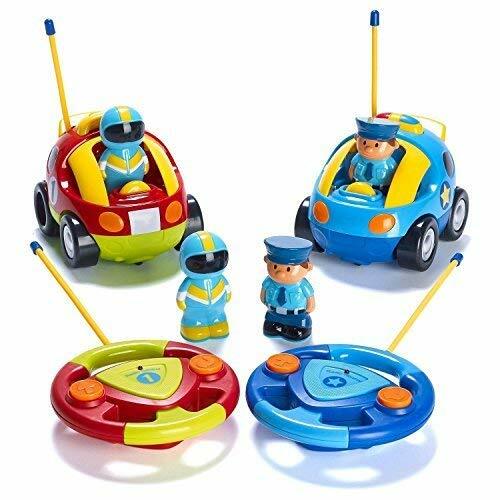 This set includes one police car, one race car, two action figure policemen, two figures of race car drivers, and two remote control (one for each car). So your child can play with others, the two vehicles are on different radio frequencies. Both cars will operate independently at the same time. This toy requires lots of batteries – three in each vehicle and two in each remote. Batteries are not included. The cars make loud, non-stop noise while they are being operated. You cannot adjust speed or steer these cars. Simple toys that teach shape and color recognition, spatial reasoning, and fine motor skills are good for two-year-olds. That is why the Cubbie Lee Premium Bead Maze Activity Cube is a good toy for two-year boys. This cube suction cups to smooth surfaces so your toddler can enjoy hours of fun. All the pieces are non-toxic and pieces are secured to ensure no choking hazards. There is a guarantee with this toy. 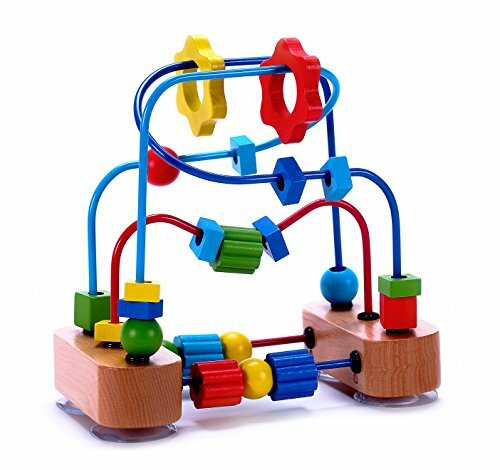 The Cubbie Lee Premium Bead Maze Activity Cube has suction cups on the bottom of it to hold it in place as your child plays with it. This toy will help develop shape and color recognition, spatial reasoning, and fine motor skills. The cube only has non-toxic paint on it and all pieces are secured so there are no choking hazards. All pieces are also smooth to prevent splinters or rough edges. This toy is appropriate for children twelve months and older. Cubbie Lee has a five-year warranty on the cube and a 30-day money back guarantee. The suction cups only stick to smooth, flat surfaces. While it states that they will not, if a bead or piece of one gets loose, it poses a choking hazard. Children love the world of sports, which is why knocking pins in the Play, iLearn Kids Bowling Play Set is so rewarding. Even the bowling ball is lightweight and sized for a two-year-old’s hands. The pins and ball are soft and can be carried around in the plastic carrying case. The pins and ball are perfectly sized for the hands of toddlers and make it fun for pretend. This set helps build imagination,hand-eye coordination, gross motor skills, and balance. Let your child enjoy bowling with this foam bowling set. 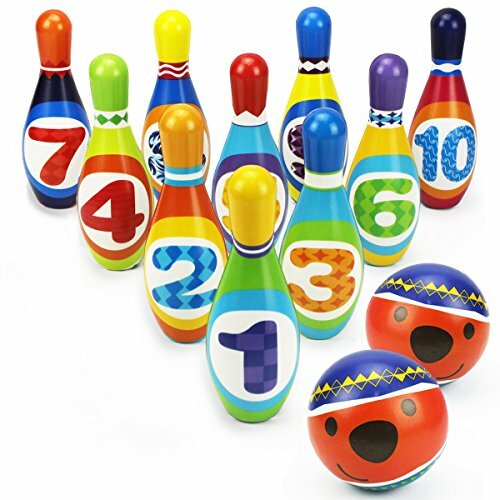 This set by Play, iLearn Kids contains ten foam bowling pins and two lightweight bowling balls. The size of the set is perfect for little hands to handle. The Play, iLearn Kids Bowling Play Set comes with a carrying case for storage and portability. This set can be played indoors or outside. This set helps a child develop motor skills and hand eye coordination. It also helps with balance and gross motor skills. This toy can be played by one child or by a group. The pins are only seven inches tall while the balls are the size of a softball – so everything is on the small side. This may be good for two to five year olds, but even the older children may have a hard time getting the pins to stand up straight. You never know if you have the next Michael Jordan on your hands until you give your little one a little bit of hoops time. 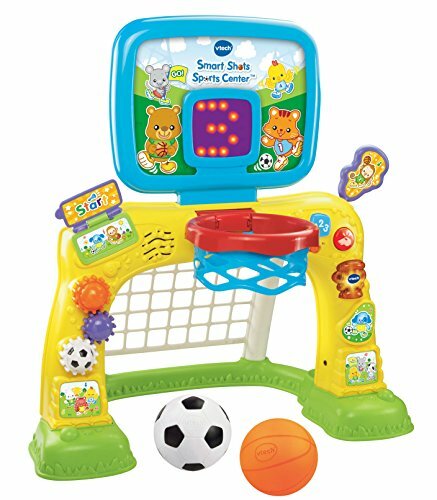 Or better yet, just give them a little bit of fun with this Little Tikes EasyScore Basketball Set. This adjustable height basketball set comes with a junior sized basketball and an oversized rim. This set will help your child develop hand eye coordination, fine motor skills, and social skills when they play with others. This set can be used indoors or outside. 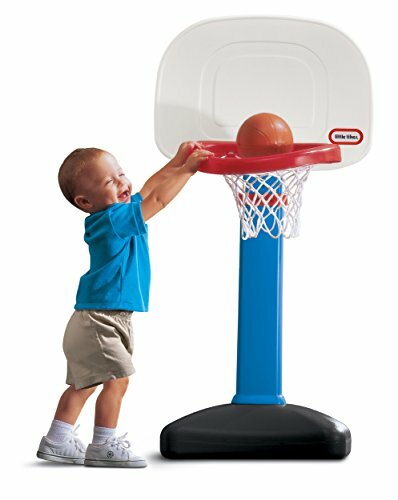 The Little Tikes EasyScore Basketball Set has a hop that can adjust to six different heights between two and four feet. This set includes a junior basketball and an oversized rim. This set helps your child develop hand eye coordination, fine motor skills, and social skills when they play with others. To stabilize the stand, the base has an area that you can fill with sand. This basketball set is appropriate for children aged one and a half to five years old. This set is weather resistant plastic for outdoors or you can use it inside with the rubber ball. It is easy for children to knock the set over if it is not weighed down. If left outside, the sun can cause discolor to happen. The farm is more than just a roof over the animal’s head. The set allows your child to interact and care for the animals properly. The part has multiple swinging doors for your child’s animals to enter and exit through. A farm bell allows your child to call the animal’s home. A silo on the side of the barn holds corn. Your child can twist the top of the silo to hear the corn pop and watch the corn fly around. The hayloft can be opened and items can be dropped through. The farm can become even more interactive if batteries are installed. A discovery button can be pressed by placing animals on top. This button then lets out a myriad of sounds and phrases that help create the farm ambience. It will also turn on lights and automatically open up the different stall doors for the animals to enter. 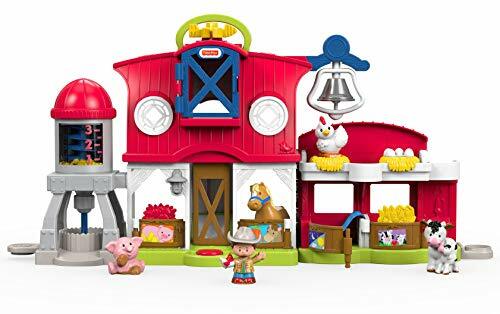 The Fisher Price Little People Caring for Animals Farm Set includes everything you need to play: the barn, Farmer Jed, a pig, a cow with her calf, a chicken, and a horse. By pressing the button up front, your child will hear animal sounds, phrases, and songs. The button also opens the stall doors and turns on the light. Another button will make the chicks hatch. Your child can drop things through the hayloft which activates more phrases, sounds, and songs. Turning the silo will rotate the corn crop and cause a popping sound. Your child can even use the metal bell to attract the animals. All little people figures are compatible with this set. There is even a caring handle to tote your farm around. What two year old boy wouldn’t want two toys in one? 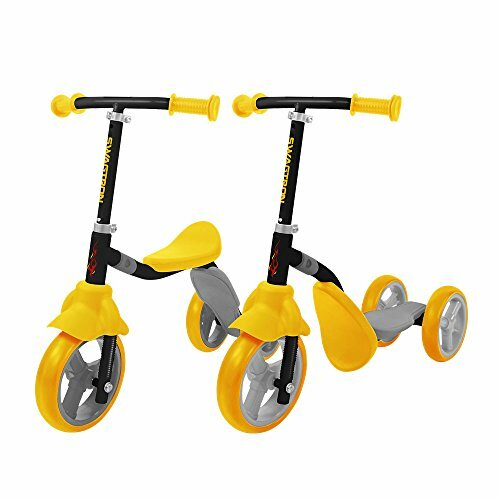 That’s what they get with the Swagtron K2 Toddler 3 Wheel Scooter & Ride On Balance Trike 2 in 1. Not only do they get a trike but a 3 wheel scooter. It just takes a click and twist to go from one to the other. Both designs are very stable with the three wheel design. The design is adjustable to accommodate different heights. The Swagtron K2 transform from a tricycle to a scooter and back with a twist and click. The tricycle is very stable with the three wheel design. The Swagtron is adjustable to accommodate different heights. This bike scooter is recommended for children two to five years old. This bike scooter will support up to forty-four pounds. The bike has a sturdy metal frame that is still lightweight. This bike scooter is not very stable, even with two back wheels. The bike scooter must be balanced by the rider as the bike scooter will not even stand on its own. Let your little break out his cute overalls that his uncle bought him and give him the Boley Green Farm Tractor Educational Light and Sound Toddler Vehicle to play with. This toy will not only entertain your toddler but help him develop. This tractor has flashing lights and sounds. There are three buttons that offer different tractor sounds. This toy encourages creative play. 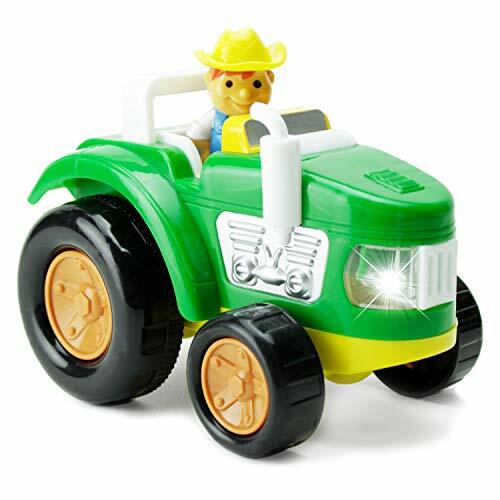 The Boley Green Farm Tractor Educational Light and Sound Toddler Vehicle is a great vehicle to entertain and help you child develop. The tractor has flashing lights and sound. The tractor has three buttons that offer different tractor sounds. The batteries are included and secured in a compartment that screws down so your child cannot get to them. This toy encourages creative play. You can use this tractor as an educational lesson on what a farmer does and how food comes to the table. This tractor and farmer is on the small side; the farmer is five inches while the tractor is eight inches long. Toddlers love things that wobble and they love to stack and build. 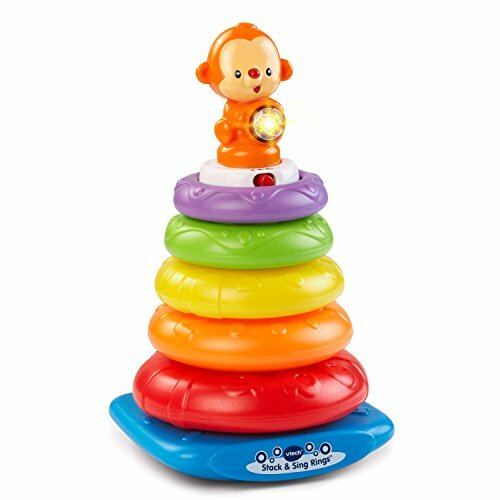 That is what makes the VTech Stack & Sing Rings toy such a great gift for your toddler. The wobble base is a challenge to stacking the rings. There is a monkey on top to encourage your toddler by lighting up and playing songs and melodies. While the rings are stacked, your toddler discovers shapes, colors, numbers, and music. This toys helps with tactile development. The wobble base of the VTech Stack & Sing Rings add a little bit of a challenge to stacking the rings. The monkey encourages the child by lighting up and playing songs and melodies. As the toddler stacks, they will discover shapes, colors, numbers, and music. The five rings are colorful and have different textures to help with tactile development. The stacking toy plays over forty phrases, sounds, melodies, and songs. This toy is recommended for children aged six months to three years old. While the toy comes with batteries for demo mode, you must replace the batteries for all features to work. Each ring has a small whole where water and moisture can get in. One of the toddler toys of the Century has to be the LEGO DUPLO. One of those sets is the LEGO DUPLO Town Fire Truck Building Kit. This set helps your child build hand eye coordination and build fine motor skills. Children can learn to put together their own fire truck and fire area to help build fine motor skills and hand eye coordination. 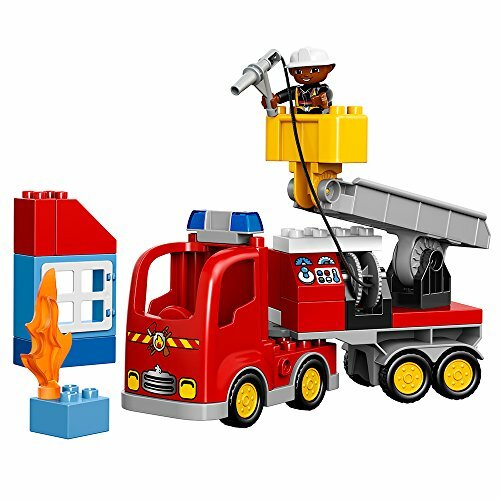 This set includes a building with a window and a fire truck that has a crane that moves. Your child can even use the retractable fire hose to extinguish fire. This set includes a window of building and fire truck that are buildable. This set is also a good way to teach children about fire safety. Parts of the figurine may be choking hazards if they come apart.